It is used to show that a work was being done in the past for a time. It might be continuing for a particular duration or from a point of time i.e. for two hours or since morning. To express time words ‘for or since’ are generally used. 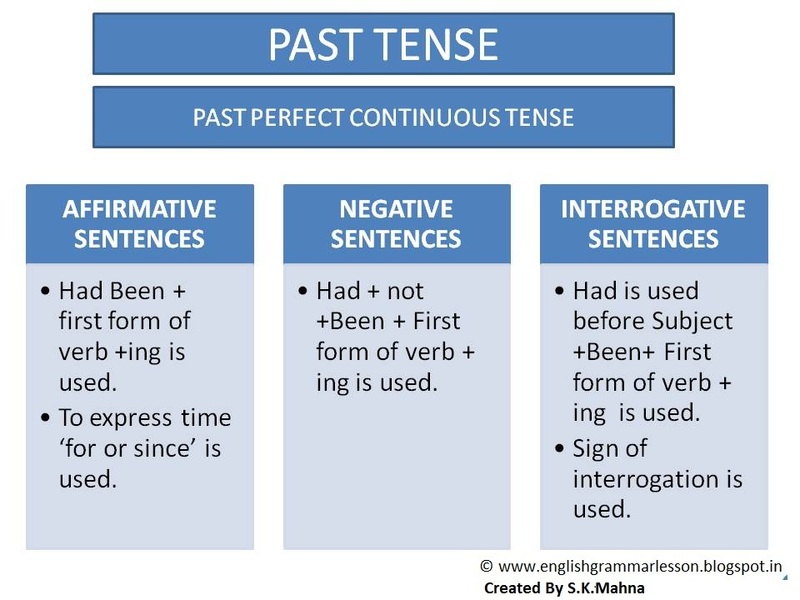 ‘Had’ with ‘been’ and first form of verb and -ing is used in these sentences. He had been working for two hours. You had been living here since 1995. In affirmative sentence, with all types of persons ‘had’ is used. And with it ‘been’ and first form of verb and ‘ing’ is used. To express time ‘since’ or ‘for’ is used. Girls had been plucking flowers for one hour. You had been reading this book since morning. She had been preparing tea for half an hour. We had been living in this house for two years. and ‘not’ is used between ‘had’ & ‘been’. She had not been singing since morning. You had not been taking your meals for two days. They had not been waiting for you for two hours. The child had not been crying for half an hour. In Interrogative sentences Had is used before Subject. Been and first form of verb with ing are used. To express time for and since are used. A sign of interrogation is used at the end of the sentence. Had he been helping you for two years? Had you been painting a picture since morning? Had children been dancing for two hours ? Had we been learning our lessons for the last two hours? Similarly in interrogative negative sentences Had is used before subject and not is used before first form of verb with ing in the sentence. Had I not been solving this sum for two hours ? Had the girls not been dancing for the last two hours? Had Mary not been preparing for her examination since January ? Had you not been waiting for him since morning? LessonEnglishGrammar provides best study material for entrance exams. Top Coaching Institute for CAT, BANK Exams,SSC CGL, CSAT, GRE, GMAT, NTSE, IPM, CMAT, CLAT, AIPMT, JEE, IELTS, TOEFL.